Floods, storms, burst pipes, or any other type of water damage can occur unexpectedly. When your commercial property is suddenly threatened with water damage, it can be frightening and put a halt on your daily business operations. We understand that getting your business up and running again in a timely manner is your number one priority. Hiring a commercial water damage restoration company will be the first step in getting your commercial property restored. DriForce has served the Metro Detroit area since 2009 and our team of experts has the skills and resources to take care of your commercial water damage restoration professionally with minimum downtime. In our years of experience, we’ve seen the hardship that water damage inflicts on businesses. That is why we are dedicated to easing the recovery process by responding as quickly and effectively as possible to help minimize lost revenue for your business. 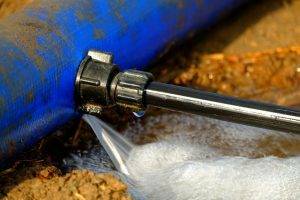 Whether you’ve suffered commercial water damage through faulty plumbing in the building or extreme weather, the key to water remediation is immediate response. DriForce works closely with insurance companies to get claims processed quickly so that we are able to begin the restoring process as soon as possible. Commercial water damage restoration and cleaning involves a series of complex steps that need to be taken and it’s critical that your water damage restoration experts have top-of-the-line equipment and technology to ensure nothing goes unnoticed. As Institute of Inspection Cleaning and Restoration certified professionals, DriForce technicians know how to accurately evaluate drying conditions and effectively use our powerful dehumidifiers to remove moisture from your commercial business property. We handle commercial water damage clean up, water removal and commercial water damage, repair to carpet, floors, drywall, building structure, and more. Moisture detectors, hygrometers, and other meters to measure the extent of moisture saturation. Infrared cameras to identify water location. Truck-mounted and portable extraction units that perform efficient water removal. Drying equipment helps prevent swelling and warping of floors, walls, and furniture. High-speed air movers create airflow across walls, carpets, pads, and furniture, evaporating moisture. Deodorization products to control odors from excessive moisture. Disinfection products to stop the growth of bacteria, fungi, mildew, and other harmful microorganisms. Don’t let commercial water damage from an unforeseen event cause you to lose hope for your business. The commercial water damage restoration technicians at DriForce have the solution to help get your commercial business up and running again in no-time. Our licensed, insured, and certified team is ready to address your water damage needs whenever you’re ready. We are available 24 hours a day, 7 days a week, so give us a call at (877) 638-0081 or fill out our online form for a free estimate today.